Foreman’s General Store offers a large variety of garden supplies, fertilizers, plants, and preventative care for your lawn. We also want to offer you the best garden supplies so that you are successful and happy with your lawn or garden. 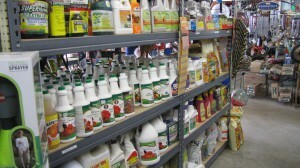 An important garden and lawn product that we carry is a wide selection of fertilizers. If you want to keep your lawn or garden organic then we also have organic garden products including fertilizers, mulches and compost. Other garden supplies that we carry to meet all your garden product needs include garden seeds, pest control products, fire ant products, fly and pest control products, and weed control. To find out more about what we have to offer for your garden products here at Foreman’s General Store, click here.